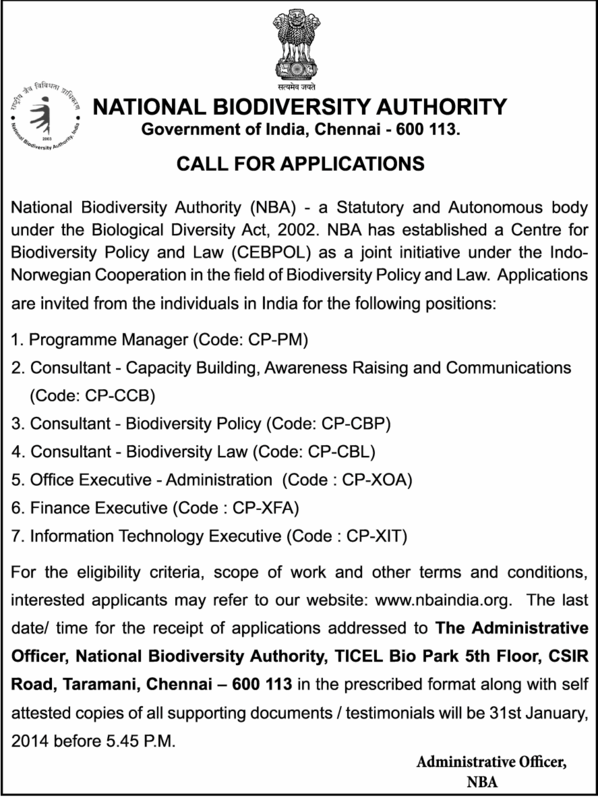 National Biodiversity authority Government of India Chennai published the notification for the recruitment of various posts. NBA is statutory and autonomous body under the biological diversity act 2002. For the eligibility criteria, education qualification, age Limit , scope of work and other terms and conditions, interested applicants may refer to official website of NBA India which is : www.nbaindia.org. last date! time for the receipt of applications addressed to The Administrative Officer, National Biodiversity Authority, TICEL Bio Park 5th Floor, CSIR Road, Taramani, Chennai — 600 113 in the prescribed format along with self attested copies of all supporting documents /testimonials will be 31 January, 2014 before 5.45 P.M.